Frank Feschino’s telephone call came as a surprise this past summer. 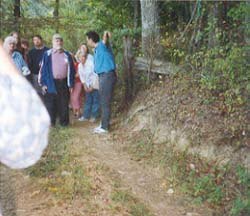 We had met at a conference in Florida a few years back when he had mentioned he was researching the Flatwoods Monster UFO event of Sept. 12, 1952. Our pictures were taken together and that was about the end of it. 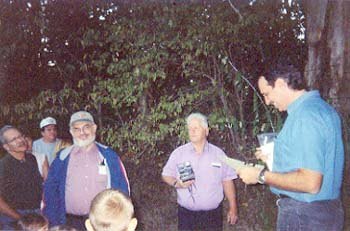 Now Frank, an artist who has done film school as well, was asking if I would help him out by attending the Flatwoods Monster 50th Anniversary event in Flatwoods, West Virginia, the weekend of September 12, 2002. There were more conversations and I agreed as long as they would cover expenses. I hadn’t been in West Virginia for years, though I had spoken at West Virginia University in Morgantown. 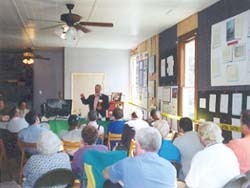 Frank wanted me to speak on two afternoons at the newly set up “museum” or event center and do some media interviews. did some homework reviewing what had been written about the case by Jerome Clark, Donald Keyhoe, Dr. Joe Nickell, and others. Some was impressive. The plan was to drive to Bangor, Maine, fly to Cincinnati and then to Charleston, West Virginia. Frank would pick me up with the mayor and drive the 60 miles on Interstate 79 to a motel in Sutton, next door to Flatwoods. That morning was jinxed. I got on the connecting flight in Cincinnati with a few other passengers. Then we were told to get off, just a small problem with the plane and they were bringing over another aircraft. While waiting there was a major Security Alert and we were all chased out of Terminal A. With all my travelling, this was my first such security adventure — and I hope my last. I spent a few hours waiting in line then finally getting through security to find that the plane had left and I was booked on a much later flight and wait listed for a somewhat earlier flight. I tried calling Frank who was of course at the airport in Charleston. I was the last standby let on the flight. Frank was waiting with the Flatwoods Mayor. They hadn’t been able to get any useful info from the airline, but somebody who got off my supposed flight said things were a mess. Fortunately, we did arrive in time to take the tour leading a bunch of people who had come for the event to the actual site of the encounter with the monster. Frank led the tour as we walked past the big tree which the monster came from behind. We walked up the hill to the top where the UFO had landed and the gully to which the UFO had migrated. We were there exactly 50 years to the minute after the event. AFB, had called saying that not only were there jets scrambled over Washington, DC, during the famous July 1952 flap of sightings (even over the White House) but frequently for the following year, which would include the time of the Flatwoods case. The base was definitely but quietly concerned about UFOs. The airman noted that in one instance two jets had been sent up after a UFO and only one came back. I spoke without slides both days in the small museum meeting room which had been decorated with Frank’s photos and drawings, did several interviews and met with several witnesses including Mrs. May, the key witness, and one of her sons who was there and had also been a witness. It turned out that the Mayor had also seen the object fly over. Only about a 15' section of the big tree that had been there in 1952 was left. The “Monster” had come from behind the tree. The branch under which the FM had passed was 12 feet above the ground. The monster was floating about a foot or so off the ground (thus being about 10' high) giving off some kind of oily substance which stained clothes of some of the witnesses and whose smell made some of the boys quite ill. It was clear that the monster was not too much like the drawing which had been spread around after being made by an artist for the We the People TV show on which Mrs. May and a local reporter appeared within 2 weeks of the event. It was much more mechanical and had antennas instead of hands. We heard for the first time a tape that had been made many years earlier of a show hosted by Long John Nebel, the old New York City talk show host who often dealt with UFOs. Nebel interviewed naturalist Ivan Sanderson in depth. Sanderson had gone to West Virginia and talked to many witnesses within a short time of the event. Gray Barker of Clarksburg WV had also interviewed witnesses soon after the event. 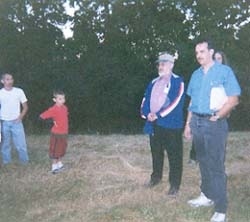 The local reporter, Mr. Stewart, had interviewed many witnesses and was aware of other sightings in the area that same weekend. because of his film school training, videotaped extended interviews with many of the key people including both Colonel Leavitt and journalist Stewart before they died. Of course, there are some who say the whole story was baloney with the kids making up stories to get attention and the so called monster being nothing more than a large barn owl because of the way the top of the monster (seemingly a protective helmet) was shown as being backed by something in the shape of a playing card spade. Naturally in the tradition of noisy negativists, these debunkers did their research by proclamation rather than investigation. long, very misleading article in Ron Story’s 2000 Encyclopedia. It was just scared youngsters seeing a barn owl and a meteor landing on the hill. A ten foot high owl would really have been something, especially one able to float without moving its wings and without a branch to set on. For a large glowing Meteor to land without making a loud explosive sound and not creating a crater and not leaving any meteorite residue would be truly remarkable and especially when it had to change direction and slowly move across town. 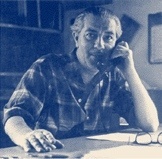 Frank Feschino has done most of his work very quietly and has been almost obsessive about secrecy. I feel particularly privileged to be able to read a copy of his manuscript about the case. I surely hope that a publisher will soon be found and that a motion picture production company is not far behind. and on testimony by other witnesses from a nearby town where a “monster” was also seen, I think that at least the exterior portion of the monster was mechanical. It made me think of a hazardous material protective device — perhaps with an Extraterrestrial Biological Entity inside. It seems clear the object was in trouble when it landed. 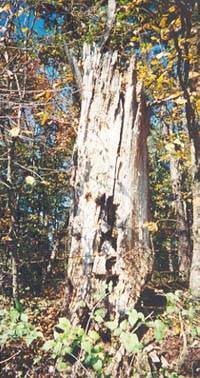 There is far more evidence relating to the Flatwoods Monster event than was the case with regard to that other West Virginia monster, the Mothman. Although Frank Feschino has already collected a huge number of clippings about the case I would be most happy to receive any that readers can dig up from any newspapers for September 12-16, 1952. They may refer to UFOs or meteors or missing jets seen East of the Mississippi and can be sent to me at POB 958, Houlton, ME 04730 USA. Please indicate the date of the clipping and the name of the newspaper. I will forward them to Frank. 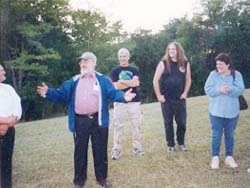 The best website to check out is Frank Feschino’s at www.flatwoodsmonster.com.